A happy new year from us at Electric Corby! 2016 was an eventful year, not least for UK energy, with cuts to renewable subsidies, the approval of Hinkley Point C, and the demise of the Department of Energy and Climate Change. This, alongside the uncertainty around Brexit, meant that the UK saw itself fall from a regular top 10 in Ernst and Young’s Renewable Energy Country Attractiveness Index to 14th, behind Morocco and South Africa . But while 2016 may have seemed doom and gloom (with some headlines still being hard to fathom *cough* Donald Trump), there’s lots to look forward to for the UK energy sector in 2017. • Time of Use Tariffs as a tool to manage grid peak pressures – Green Energy UK have become the first UK energy provider to offer a time-of-day electricity tariff. • The biggest building in the world! 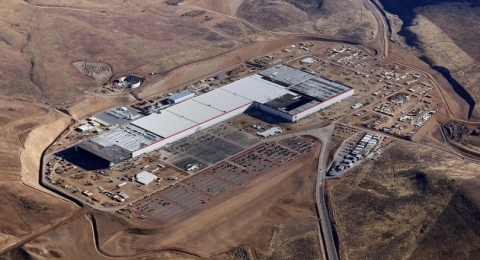 – Tesla have begun producing lithium ion batteries at their Gigafactory in Nevada (which is currently only 30% complete) and aims to bring down the cost of battery storage. This, alongside Tesla’s other innovations such as the solar roof, will make Elon Musk once again the one to watch this year – or will China steal his thunder! We can’t wait to see what 2017 brings and the start of our community energy revolution!